This past summer Little White Dress participated in a colorful and fun styled shoot at Z Mansion at the Ranch. 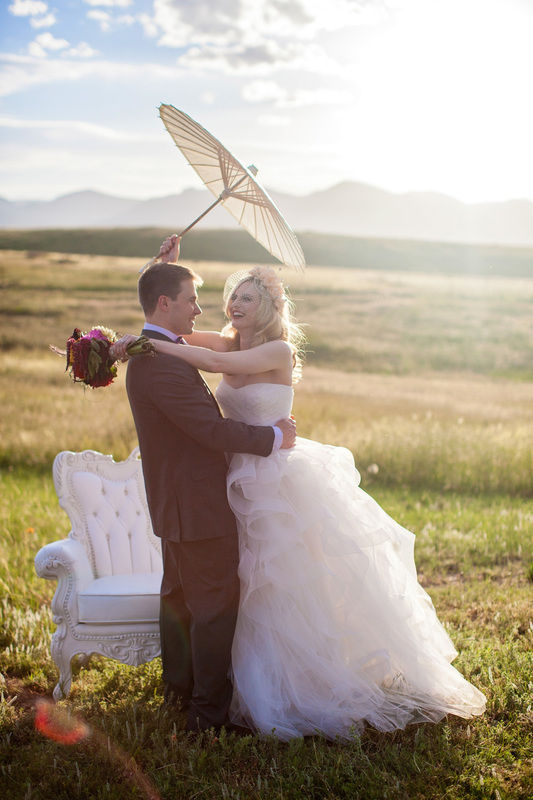 The concept is so cute: Inspired by a stylish couple whose first date was at the carnival, some incredible Colorado wedding vendors created an amazing wedding look to show just how fabulous it can be when a couple draws their wedding inspiration from their own story… and that you can do it no matter how odd or crazy it might seem! Fitting with the glamorous and subtle take on the circus theme, the shoot featured the Reem Acra Eliza gown from Little White Dress. This gown is SO much fun, with incredible volume and texture, yet so elegant and flattering. For how dramatic this gown is, it's also incredibly light and easy to move in. We love this dress! The shoot was featured on Every Last Detail, a really wonderful site for wedding inspiration and planning. Check it out! Below are some of our favorite photos from the shoot, all by Urban Safari Photography. (Including the cutest pups ever!) Don't miss the end of the post for a list of all the awesome vendors involved. Enjoy!